Looking to watch cable TV on the move with Kodi? In this article, we’ll be exploring the best Kodi cable TV addons and mentioning some to avoid. Kodi is an extremely customizable media center app. It has seen a rise in popularity recently, in part due to how easy it is to install on multiple platforms. Kodi can be installed on most popular devices including desktop PCs, Android tablets, Amazon Fire TV, and USB flash drives. As there are only very minor differences between Kodi’s mobile and desktop versions, it’s likely your addons will work on both platforms. Many people have cable TV subscriptions but most don’t realize that they can watch via Kodi. 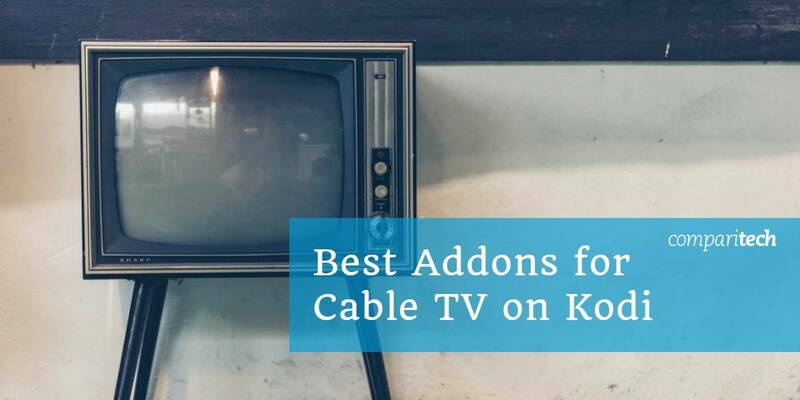 This article will highlight some of the best cable TV Kodi addons, explain the benefits they offer, and show you how to install them. Some people connect to virtual private networks (VPNs) to conceal unauthorized streaming from their internet service provider (ISP). Despite this, VPNs have many legitimate uses and can benefit even those that only stream from official sources. VPNs encrypt your internet traffic, preventing it from being read by any outside observer. This prevents the majority of Man-in-the-Middle attacks and stops your ISP from selling your browsing habits to third parties. Because your ISP can’t tell what you’re doing, they can’t use your activities to justify throttling your network speeds. Not every VPN offers the same level of service. Some keep detailed logs of the sites you visit, making it easy to trace your activities back to you. Others might include malware or simply slow your connection to the point that streaming becomes difficult. For these reasons, choosing the right VPN provider is crucial. We recommend IPVanish. It provides fast, stable connections to servers in more than 50 countries. Additionally, IPVanish is one of the easiest VPNs to install on multiple platforms, with dedicated iOS, Android, and Amazon Fire Stick apps. NO-FUSS STREAMING:IPVanish offers high speeds, excellent security features, and keeps no logs. Many cable TV providers have begun to create online platforms where you can watch their content. However, Kodi makes it easy to browse content if you have multiple cable TV subscriptions. Official addons sometimes offer greater control over the content too. You may be able to stay logged in for a longer period of time or change the type of results you see when you search. Kodi also offers greater control over the video itself than most online players. You can zoom in, change the brightness, or even watch in 3D. Below, we’ve listed some of the best cable TV Kodi addons available. USTVNow is a streaming service originally designed to let members of the US armed forces watch American TV while overseas. Despite this, there is no verification system in place and anyone can sign up. Because USTVNow is intended for use outside of the US, no VPN is required to watch the streams. 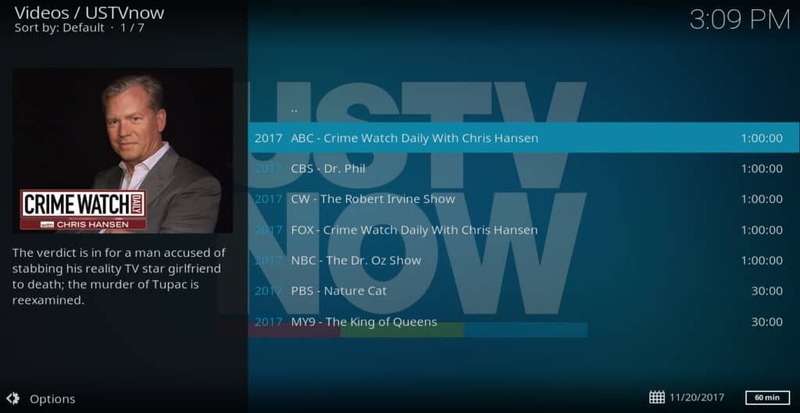 The USTVNow Kodi addon features a good selection of news, sports, and entertainment channels. A free membership is available but this only provides six channels (ABC, PBS, CW, Fox, My9, and CBS). Paid plans start at $19 per month and unlock a further 18 channels. They also let you view HD streams and use the DVR features. The USTVNow addon can be found in the SuperRepo repository. The iPlayer is the BBC’s online streaming platform. It offers live and on-demand content from several BBC channels with new content added a few hours after it airs. The iPlayer is free to use as long as you have a valid UK TV License, however, a VPN will be required if you’re outside of the UK. Once installed, iPlayer WWW will appear as both a video and music addon. This is because it provides access to live radio as well as TV streams. The content is well organized, searchable, and can be viewed in HD. 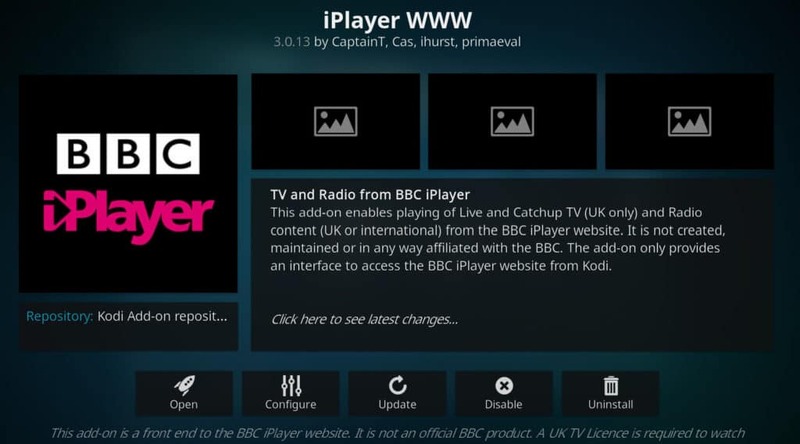 The iPlayer WWW addon can be found in the official Kodi addon repository. If you have a cable subscription and receive one or more of the Fox Sports channels, you can use the Fox Sports Go addon to watch via Kodi. It should be noted that there isn’t any free to watch content but once you log in, you’ll be able to view recent coverage for a wide selection of sports. Certain games are subject to regional blackouts and can’t be viewed without an IP address from the appropriate area. Like the CBS addon, Fox Sports Go allows you to select your preferred stream quality. It also has the option to toggle Fox Deportes programs on or off in case you don’t speak Spanish. 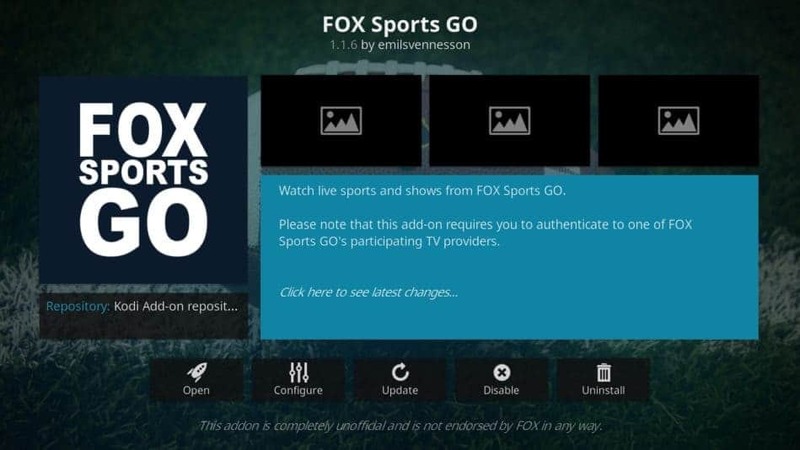 The Fox Sports Go addon is available from the official Kodi addon repository. 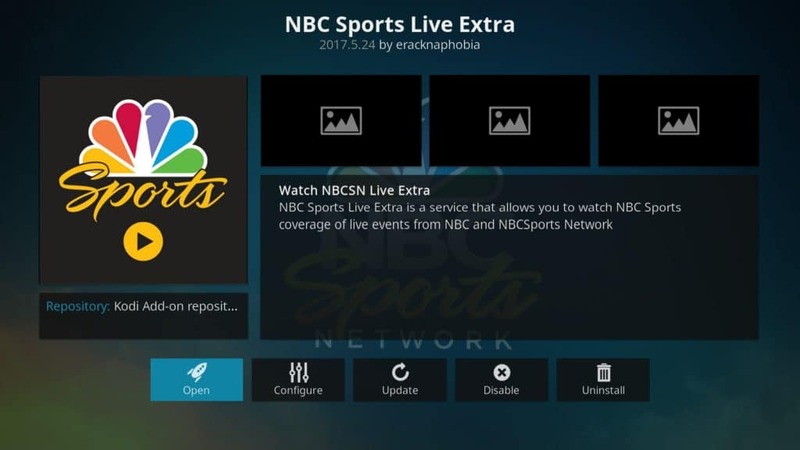 The NBC Sports Live Extra Kodi addon allows you to watch live sports from NBC’s sporting channels. There’s a small selection of free-to-watch content including replays, highlights, and featured clips but to watch live games, you’ll have to sign in using your cable provider details. This addon has above average customizability. It allows you to view only free content, change the quality of the streams, and exclude certain sports from showing entirely. NBC Sports Live Extra is available from the official Kodi addon repository. Some third-party Kodi addons offer access to hundreds of live streaming TV channels for free. At first glance, this might seem tempting but if something appears too good to be true, it usually is. These addons below use unauthorized streams which are less reliable and generally lower quality than those used by official addons. As such, the addons below should be avoided at all costs. Kodi makes it easier than ever to watch cable TV on the move. If you’re looking to watch on-demand content, you might be interested in our guides to the best addons for movies, cartoons, or anime. Using Kodi on an Amazon Fire Stick? We can show you how to transfer a build from one of your other devices, install Kodi forks, and update Kodi. If Kodi isn’t working properly, check out our guides to increasing speed and resolving problems on the Amazon Fire Stick.